Helping bring your local marketing campaigns to life. Our team is dedicated to working closely with you to make sure every “i” is dotted and every “t” is crossed, and your plans come to life just as you envisioned. We’re committed to helping you reach target audiences, increase sales and support local sales teams. Please take a moment to learn more about our solutions to your most common marketing challenges through the services outlined below. Every day, we’re surrounded by technologies and systems that are meant to simplify and organize our lives. We’re at our best when technology enhances the way we work and allows us to focus on what matters most. But technology has a way of doing quite the opposite, creating more work, more disruption and more interruption. At Vya, we believe there’s an elegance to technology — a way to make tools and products work for you, not against you. We have built a full end-to-end marketing resource management platform that helps companies customize and localize their marketing, messaging and materials for more relevance, impact and ultimately business success. 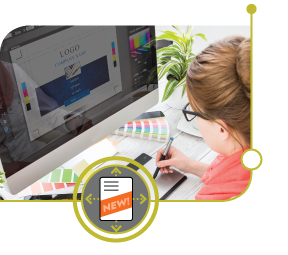 We integrate our technology, custom print and fulfillment services seamlessly with your existing systems and processes, enabling you and your teams to effortlessly manage, customize and push content to virtually any media, any channel, any time. Our entire company, every single person who works here, is dedicated to delivering simple. Something that is in short supply as your business grows. To see more about how our people help simplify marketing and improve your business, please watch our video. Making simplified systems work within your organization takes a strong team of smart, dedicated people with an unwavering determination to simplify, ease transitions, solve problems and build relationships. Our leadership team lives up to this every day, creating order and simplicity in a complicated, constantly evolving space. There are alternate approaches to making your brand relevant for local markets. You can centralize all of your marketing efforts in one place, building a team of people to execute all individual requests from a long list of regions, agents and sales teams. Or you can decentralize your efforts and give control to the local managers and sales teams to develop their own materials. One approach gives you complete control of your brand, but puts a massive burden on you and your team. The other gives your local teams control, but risks brand consistency. There’s a better way. Our Marketing Resource Management (MRM) systems and solutions allow you to centralize and control all key brand assets and messaging within a comprehensive system. It gives local representatives an easy interface to effortlessly customize and effectively implement campaigns, messaging and promotions. It enables relevant, local communication across both digital and traditional channels – from interactive displays to direct mail. This central approach offers the best of both worlds, giving you total control over your brand, but also giving local markets the ability to properly customize messaging and design elements as needed. Better outcome, less effort, more ways to optimize your work. That’s what simplified systems really means. Welcome! Please take a moment to read our recent news and announcements as well as insights from Vya's experts in influential media outlets. At Vya, we believe there is an elegance to technology – a way to make tools and products work for you, not against you – making it a silent, powerful partner. Our entire company, in fact, every single person who works here, is dedicated to developing, building, enhancing and delivering simple technology – products and services that seamlessly organize, customize, print, ship and deliver meaningful marketing materials to virtually any channel, platform or location. Contact us today to learn more about our solutions, systems and print capabilities, and how we bring our unique approach to simplifying marketing workflows to life. Make your next career move your best career move. Vya integrates marketing technology, custom print and fulfillment services building a full end-to-end marketing resource management platform. We customize and localize marketing, messaging and materials for more relevance, impact and ultimately business success. Vya offers employees an opportunity to build on their current skills and develop new ones in a fulfilling and energetic setting. We offer competitive compensation and benefits as well as a friendly, fun environment you'll be excited to walk into every day. The Vya Systems Project Coordinator is responsible for providing the support and training to facilitate systems usage and user adoption as well as managing on-line project timelines to ensure quality and on-time delivery for one of our top clients. o	Manage site support for clients to facilitate use of systems, product availability & service offerings that will result in increased usage & revenue. o	Manage on-line project timelines to ensure product quality & on-time delivery to meet sales goals and objectives. o	Creates & facilitates training to all levels within a client to increase understanding of system functionality and product availability that will increase usage, user adoptions, & revenue. o	Prepares reports needed for clients as necessary. Uses Microsoft Excel (pivot tables, sort/filters, vlookup formulas, concatenate formulas, conditional formatting, etc.) to manipulate data needed for internal projects and post-project reporting. This is a unique role in a professional, fast-paced and forward-thinking environment. For immediate consideration please submit a current resume to Jessica Waddle at jwaddle@aliniti.com. For more information or to apply for a position, please complete the form below. Local marketing can be challenging. That’s why at Vya we’re dedicated to providing you with informative resources that help solve some of your biggest marketing obstacles. Please take a moment to look through our white papers, tip sheets, brochures and more to learn from our insights and experience on how you can simplify your marketing workflow. Our "Briefs" tab even include resources and presentations to share with executives and leadership teams to communicate and demonstrate the impact an MRM system can have on your business. Have a problem or topic you don’t see addressed? Click here to tell us more so we can develop the resources that work for you. Our white papers dive into common local marketing challenges across multiple industries. We explore challenges and offer solutions to help make marketing a little easier and a lot more effective. Tip sheets offer quick tips on overcoming common local marketing challenges such as compliance, rebranding and much more. Looking for more details on these issues? Try our white papers or briefs, where we provide deeper insight gained from our experience working directly with clients to deliver solutions that work for them. Learn more about Vya’s systems, solutions and print capabilities, and our team’s dedication to helping you solve local marketing challenges and simplify your marketing workflow. Interested in learning more about our solutions, systems and print capabilities? Please contact us at 800-426-7921 or sales@vyasystems.com. At Vya, we are dedicated to helping our clients overcome their most challenging obstacles in local marketing, and we are exceptionally proud of what we can help our clients accomplish. We strongly believe that it is our commitment to building technology and systems that do more than just work. It is because we provide solutions that deliver precisely what each company needs, and what each person within a company needs. Our people create order and simplicity in a space that is filled with complication. It is their dedication, their energy and their unwavering determination to simplify, ease transitions, solve problems and build relationships. This is what powers our products and makes our customers’ jobs easier, more productive and more impactful. Of course, what we say here doesn’t really matter. It’s how we bring this approach to life for our clients that matters. Please take a moment to review our case studies below that demonstrate this unwavering dedication to solving our clients’ biggest challenges and delivering simple solutions that work. Our videos are aimed to help provide important, relative information on local marketing challenges, marketing resource management and Vya’s solutions, systems and print capabilities. Innovative local marketing campaigns are a critical way to reach your target audience with relevant messages on promotions, services, new product launches and more. Coming up with the big idea is just half the battle. Once that idea and campaign is identified and planned, execution must be simple and flawless to make sure your message resonates the way you intended. That’s where we can help. At Vya, we put our people, services and expertise to work for you, pulling together all the pieces of your marketing campaign plan to help your company reach its goals. Interested in learning more? Please contact us today at 800.426.7921 or sales@vyasystems.com to learn more about our local marketing solutions, systems and services. Our online resources are also available for immediate download, and offer simple tips to streamline local marketing efforts and execute with excellence. Planning a successful event is more than location, theme and goal. The most important parts of any event are always in the details: making sure invitations are sent on time, ensuring name tags are spelled correctly and printed clearly, making event registration easy for attendees - the list goes on and on. Let us help with some of those details. We will work closely with you to support events such as trade shows, open houses, seminars, grand openings, sales kick-offs and much more. When you are looking for a touch that can make an event more memorable, interactive displays can build engagement for your guests with agenda information, details about speakers, wayfinding and more. When your partners are spread across the country, getting them the information they need should be an easy, seamless process. Vya can help turn that need into a reality. Our dedicated team is available to support programs and campaigns from the simple to the complex, ensuring your partners and consumers get the customized information they want. You invest heavily in the development of local markets through your MDF and co-op programs. Keeping track of how and how well local funds are spent is only part of the job. Driving smart and consistent action among local agents is a critical part of your marketing success. But every year, millions in market development and co-op funds go unused, leaving a huge hole in your marketing efforts. Vya will put a dedicated expert into action, working closely with your local dealers, agents or franchisees to improve end-user adoption and increase campaign enrollment. Your contact will build and manage a custom, flexible, scalable campaign to your end users. The campaign can be created, modified or ended dynamically, based on your pre-determined needs, by deploying live-agent calls, web chats, email notifications or personalized GoToMeeting assistance. And with multichannel notification efforts, Vya can help you easily implement and track the results of your end-user campaigns. Our team will take the pressure off your central marketing group and work closely with your local market representatives, regularly following up to ensure they are utilizing funds and utilizing them properly. You’ve invested in local markets - now let us help you make the most of your time and investment. Supporting sales teams spread across multiple regions can be a complex task. Each may need unique marketing resources based on local deals, consumers, buying patterns and more. At Vya, we can help manage that process. Our dedicated team is available to help support and execute projects and campaigns from the simple to the complex, including sales kits, new product launches and much more. Consumers today are constantly on-the-go and making purchasing decisions from anytime, anywhere on their laptops and mobile devices. No matter the platform, Vya can help you reach and inform customers across multiple digital platforms exactly where and when they need it. Our web and mobile solutions team develops websites, landing pages and native applications on both iOS and Android platforms. From digital designers to multi-platform developers, Vya builds highly customized and immersive digital experiences that can easily be versioned for individual locations, markets and regions. National brands that rely on local sales teams to connect with consumers can face many challenges. They need to provide sales channel tools to implement local marketing campaigns while maintaining control of messaging and streamlining marketing workflow. Reaching this balance is easy with an effective and easy-to-use marketing resource system. Our system helps brands connect with local consumers, empowers local sales teams, streamlines marketing operations, and much more. Templates, logos, copy, designs, and other assets are easy to access in our web-based portal. Local sales teams can browse templates and easily find the materials they need to reach local audiences. Give local sales teams the ability to easily update and customize appropriate fields in pre-loaded templates. They can personalize contact information, demographics, life stage and much more on postcards, posters, signage, and other templates available in the system. Launching effective, engaging and relevant co-branded campaigns is simple with our MRM systems, as well. Work closely with local sales team to create campaigns that will catch consumers' attention, and implement efficiently across multiple platforms. 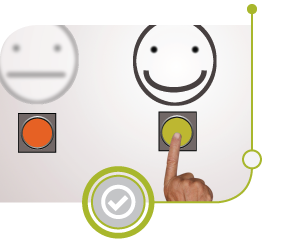 Electronic, automated approvals make ensuring brand consistency and compliance simple. Local sales channels want to sell product. Give them what they need to reach audiences. Turnkey marketing campaigns, marketing calendar, training, resources, and seamless customization and implementation helps local teams easily push your messages out to market, increasing brand awareness and sales. Make it easy to fulfill local marketing requests and support local sales teams. Marketing resource systems help automate complex or redundant tasks, like approvals, so you can focus your time on strategic, big-picture initiatives. Vya makes it easy to track and monitor the details and results of your campaigns. In addition to a robust list of standard reports that help you track key performance measures and prove ROI of each campaign, we also offer the ability to design custom reports that provide top line overview or deep dive documentation into exactly what is driving the best results today and over time. At Vya, we believe technology should take away complexity, not add to it. That’s why we fully stand behind and support all our systems and solutions. 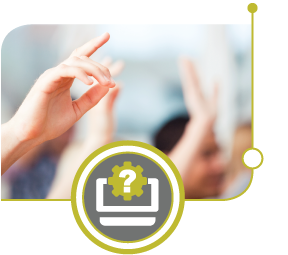 We offer regular training to help users understand the system, how it works, and what it can accomplish. We teach sales teams how to access campaigns and implement them. And our team is always available to answer questions. We even host the technology, so your IT doesn’t need to allocate resources or training to run the software we’ve created for you. Interested in learning more? Please contact us today at 800.426.7921 or sales@vyasystems.com to learn more about our local marketing solutions, systems and print services, or request a free demo of our systems. Our online resources are also available for immediate download, and offer simple tips to streamline local marketing efforts and execute with excellence. Managing local marketing budgets – from co-op to market development funds (MDF); advisory council budgets to target market funds – can be a complex task. Vya’s local marketing budget management system can help you streamline and manage the process, making sure your sales channels get the funds they need and you can manage the process easily and efficiently. 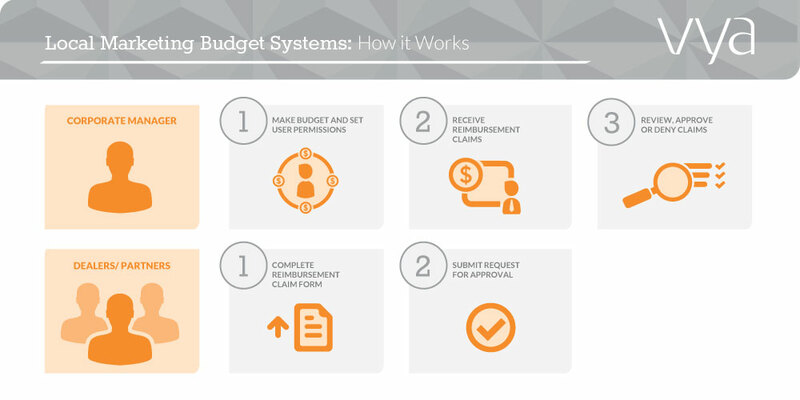 Assign, track, review, and approve budgets all in one place. Our easy-to-use portal makes it simple to manage funds across markets, and encourages local sales teams to use available funds. Partners, distributors and local sales can easily request approval, submit claims and share best practices on what’s working in their region. Vya's local marketing budget systems are easy to use, and supported by our dedicated staff. Read our resources on effective local marketing budget management. Our creative production systems helps seamlessly route and track job status, hours, review and approval of designs all from a single platform. 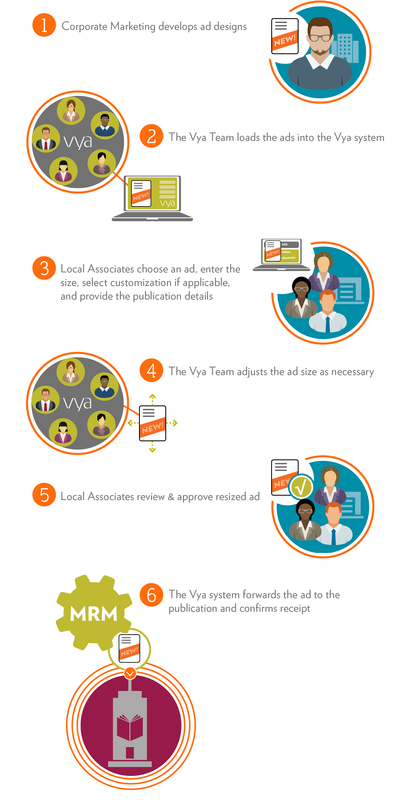 Vya’s ad systems combine ad resizing services and ad distribution automation to effectively manage requests from local associates. Build a central repository of ads in varying sizes. 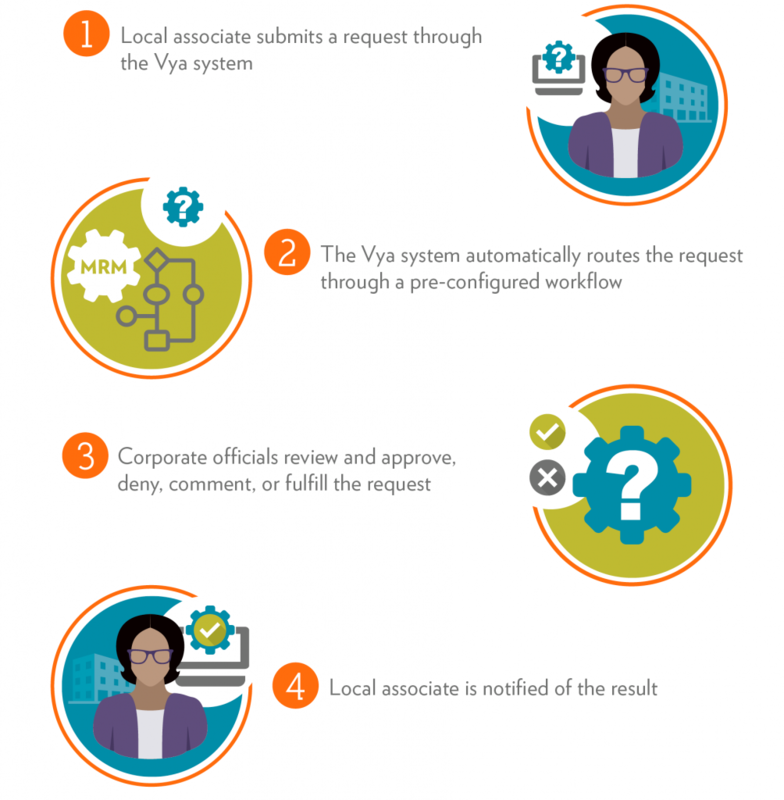 Vya request systems automate the process of collecting, approving, processing, and tracking requests from local associates. The solution is extremely flexible and can be applied to a variety of field request scenarios. 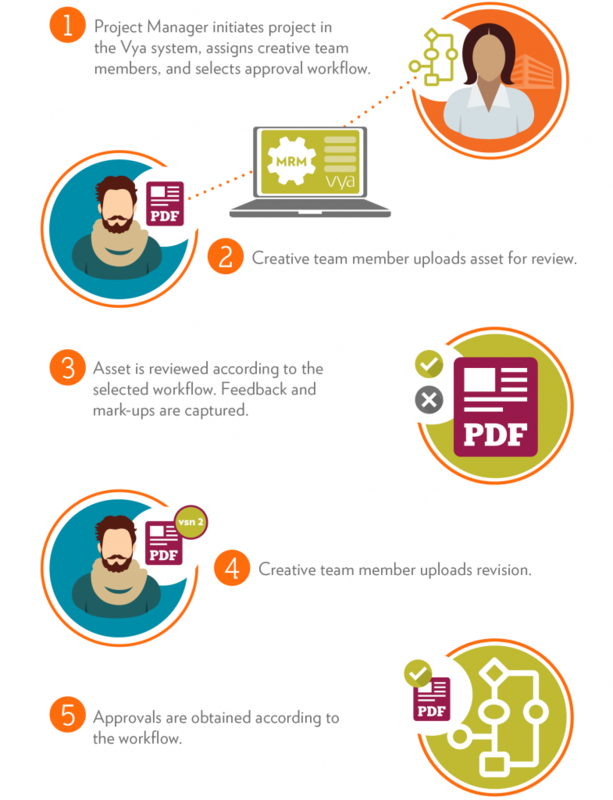 In addition, corporate policy review and acknowledgement can be built into the request workflow. Empower local sales teams and employees to be your biggest brand ambassador. Vya’s social media systems is a social content platform that solves the challenges corporations face in localizing social media communications through their distributed marketing and sales teams. Give your most powerful sales resources – employees and sales channels – the tools they need to properly build and customize posts, messaging and imagery on social channels. Easily load pre-approved posts for easy and compliant distribution across Facebook, Twitter and LinkedIn. Our team is dedicated to delivering simplified solutions that work. Our social media systems make it easy for local and corporate teams to connect with consumers, and share relevant and engaging information across select, social media platforms. Quality data is the backbone of all local marketing campaigns. It must be clean, complete, compliant and easily analyzed to assess campaign impact and performance. That's why, at Vya, we are committed to always delivering usable, effective data that companies can truly use. When you rely on our teams to distribute campaigns via mail or email, we work hard to make sure your distribution list is accurate. Our systems scrub lists, complete fields, check against compliance regulations - removing opt-out names and ensuring requirements like CASL, and others are met. Our teams can also completely manage your data to ensure you are reaching the audiences you need. We take care of the details - from managing adds, removals, list updates to building strategic, custom dashboards that track campaigns. Detailed analytics available through dashboards delivers a clear picture of what's working, and what's not. Gain a better understanding of what customer segments are responding to your campaigns, and apply that feedback to future campaigns for stronger reach and impact. Easily share messages and news on local events, sales and messaging with Vya’s simplified email systems. One powerful tool gives you the ability to manage, automate and customize your entire email based marketing programs with a few keystrokes. Whether it is a weekly email blast to your entire email list, multi-draft campaigns to specific segments or fully automated email responses, Vya email systems can help create more consistency and better management of this critical marketing channel. Best of all, Vya’s simplified email systems is built for localization, giving your local marketing teams an intuitive interface and easy-to-use tools to customize messaging, selected targeted email lists, even access pre-populated content to personalize messages by location, region or audience. You can easily upload templates, or have the Vya team create and load digital templates for virtually any ongoing email marketing program, such as e-newsletters, promotions, loyalty campaigns, drip campaigns, events, sales, and more. Vya can also help you handle full email distribution, including cleaning up data lists and ensuring all compliance regulations, such as CASL, are met. Vya’s survey & invite management systems enable corporate marketing departments to facilitate local event invitations and customer surveys. Local branches, agents, and sales teams can customize approved invitation or survey templates to easily gather and track responses from their customers and prospects. Unlike the patchwork of customer feedback tools being used individually in local markets today, Vya’s solution allows corporate marketing and regional field staff to easily review the data collected in local markets. Analysis can uncover opportunities for targeted coaching and performance improvement in individual markets. Additionally, the data gathered can reveal best practices that can be shared across markets to create cascading success. Provide templated customer surveys and event invitations to local representatives for customization and distribution. Ensure consistent and compliant branding of local customer surveys and event invitations. Gather customer response data transparently enabling targeted local performance coaching. Get a clear view into local market performance while also uncovering trends across markets. Create a full range of question field formats. Conduct keyword analysis on free-form text fields. Our survey & invite management systems integrate with Vya’s marketing resource management software — a complete ecosystem for consistent and compliant local marketing and customer communication. 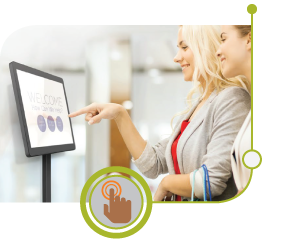 Interactive displays that are powered by Vya give you an unparalleled opportunity to connect to your customer with personalized, localized content, which means you’ll offer an immersive in-store digital experience that builds engagement and creates sales. Using familiar touchscreen technology on flat-panel displays, interactive display systems bring your message to life for your consumers and offer an enhanced in-person experience. Maximize the power of displays by giving your customers more information, more choices and compelling product insights, all while capturing data to optimize content. Bring localized interactive marketing content to any place, and at any time. 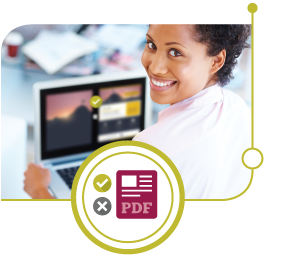 Integrate with your existing Vya MRM system to provide a new channel for existing content, video and design. Offer a single, centralized location for all types of digital assets. Give your customer key information at the point of decision. Offer a more powerful, engaging brand experience. Vya’s interactive displays will revolutionize the way your customers buy, search and experience your brand in any location. As part of our marketing resource management system, Vya provides a complete ecosystem for your content to be managed, scheduled and pushed out to any media including print, email, social and interactive displays. Leading organizations partner with Vya, not only for our best-in-class marketing resource management, but also for our high-touch approach, our user support model, and company stability. When our clients succeed, we succeed. We look forward to speaking with you to learn more about your local marketing challenges, and how our team and services can help simplify your marketing workflow. Contact us at 800.426.7921 or sales@vyasystems.com. Vya, Inc. respects your privacy and will not give, sell, trade, or rent your personal information to third parties except as required by law, subpoena, or court order. In general, you can visit Vya’s website without revealing any personal information. However, certain web pages request contact information from you, such as if you register for our newsletter or request an assessment or white paper. The requested information typically includes contact information such as name, address, telephone number, and email address. You may receive information regarding special Vya events, press releases, product-specific technical information including notifications of software updates, or other Vya-related communiqué. You may also receive information about complementary technologies from our strategic partners. You may opt out of these communications. Vya may occasionally use surveys to evaluate the effectiveness of both our customer support team and our training programs. We may use appropriate portions of support surveys or training evaluation comments to promote our products and services.